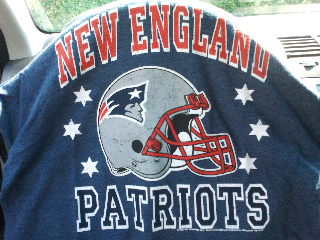 My new Pats shirt from Old Navy! They now carry official NFL garb and to my surprise (not really) a west coast store had plenty of these in stock. It's super cute and cut for women and only $19.94!! Can you believe it? Even better, I used my 30% off coupon and got it for $15 after tax. Holla holla! With my new shirt and Peyton Manning being out for what looks like most, if not all, of the season, I am hoping this will be a great year! Hubs has Ochocinco on his FF team and we are hoping for a great partnership between him and my boy, Brady. ew. we are definitely not friends today!! !